I had the joyous privilege of joining Peter and Danielle in dedicating my grandson, Camden, to the Lord during our Sunday evening service at church two weeks ago. 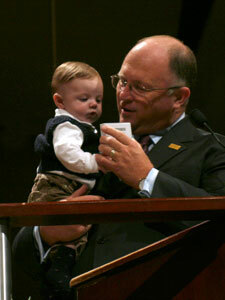 I like to choose a verse for each baby at our church baby dedications. For Camden, I chose my own life’s verse: “For I am not ashamed of the gospel of Christ: for it is the power of God unto salvation to every one that believeth; to the Jew first, and also to the Greek” (Romans 1:16). Before we prayed, I gave Camden his first Bible—which he promptly pulled to his mouth. I can see already that he has a great hunger for God’s Word, even at his young age! Seriously, we pray that Camden will have a tender heart toward the Lord and grow up with a genuine spiritual hunger. We also pray that he will be saved at an early age and serve the Lord his entire life. As I held Camden for prayer, I couldn’t help but wonder what the Lord has planned for his life. Already he has brought such joy to our family, and I know God has a great purpose and plan for him. Please pray for our family as we serve the Lord and seek to raise Camden for His glory.